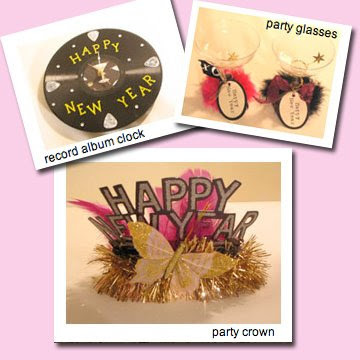 Adorn plastic party glasses with a bit of feather trim and a few ribbons, add a festive tag and some wired stars and your guests will be ready to party. Tip: Use low temp hot glue to attach the glasses to the base. parts at any local craft store. Embellish simple party hats with bits of tinsil, feathers and butterflies. Don't forget to add glitter!